I've always hated those hand dryers in some public restrooms. I can dry my hands with a towel in about 5 seconds. 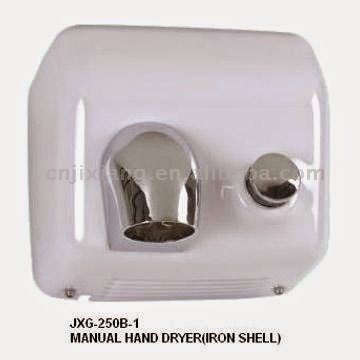 Those hand dryers, especially the older models that used to be ubiquitous, you had to "dry" your hands for what felt like five minutes to get them dry enough to finish drying your hands on your pants. I hated them. The newer ones are better. The high speed ones only take about four minutes to get your hands dry enough to use your pants. And the Dyson AirBlade models actually work, but still take longer than using a paper towel. I have been known to in fast food restaurants to walk out of the bathroom with wet hands, go to the napkin dispenser, and use a bunch of napkins to dry my hands. Suffice it to say, I loath hand dryers. And now I have another reason: they are unsanitary. And now we have yet another reason to hate hand dryers. They are filthy. Mythbusters also did a test on hand dryers last year. The entire room lit up with extra bacteria. That's why I only dry my hands on angry grizzly bears, because no bacteria is going to mess with one of them.